It all started today as we were out attending a “park day” with some of our homeschool friends. Adventure was in the air between all the kids running around the playground, playing in sand, swinging or sliding, and paling together in some imaginative play in the distance. They love the interaction, and I love to get some time to connect with the mom’s! 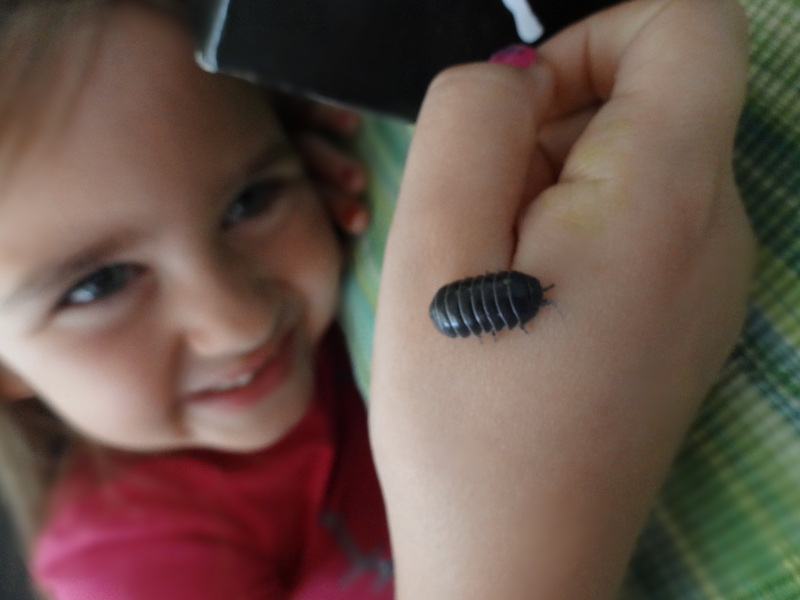 At one point, the kids happened upon one HUGE roly-poly and were all very fascinated by it. They were taking turns holding it and inspecting it of course. Somehow, it was later given to Ella to “have” and before I knew it she was begging for me to let her take it home and take care of it. 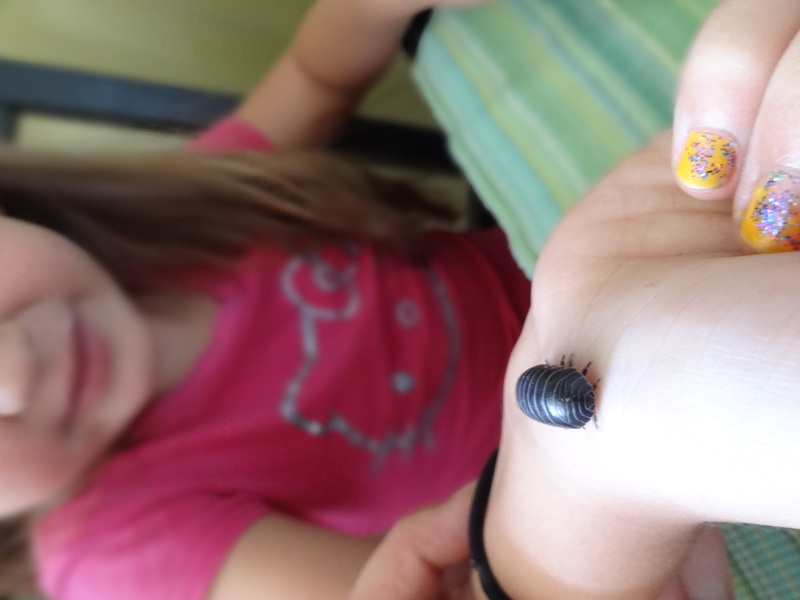 After I tried to convince her that the lil bug would be better off in its own habitat, rather than with us, I gave into the pleading as well as all the other girls encouraging this wonder of a pet. 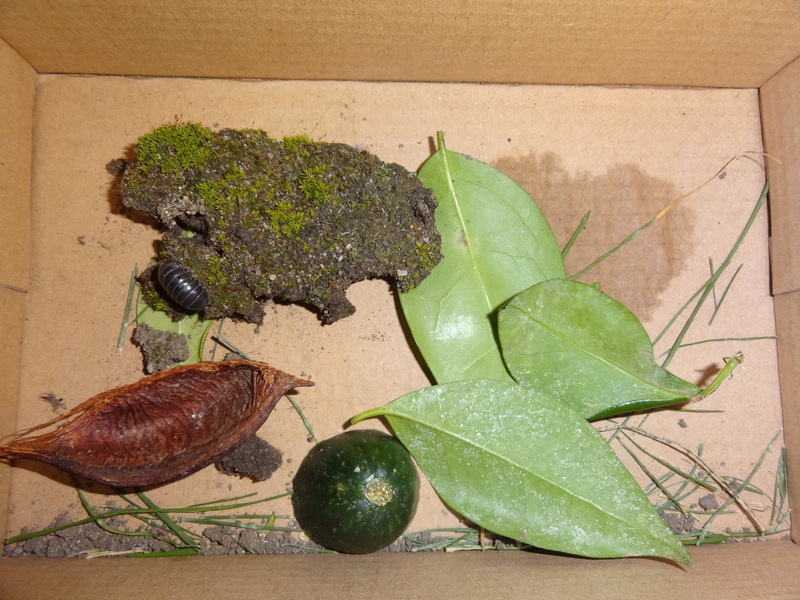 Her friends were very helpful in telling Ella how she should take care of it and what to feed it. While stopped at the gas station, she decided to take it out of the container we had for it, and hold it. Then she accidentally dropped it down the side of her seat in the back, deep into the abyss of cracker, crumb, crayon, and who knows what else is down there. Well maybe it wasn’t that bad, but after calming the cry’s of a new poly owner, I had little hope of actually finding it. I could only assure her that we would try our best to find “Sarafina” when we got home. She was happy with that answer, but I could see her disappointed face in my rear view the entire way. I was praying we would luck out. The first thing she did when we got home was hop out and make a wish on a dandelion, that her poly would be alive and found. After tearing my car apart and finally dismantling car seats, to fold down the bench seat in the back, lo and behold there was Sarafina in a little crevice under the bench, upside down and scrambling none the less. YESSS!!! Thank you lord for not letting her first roly-poly pet experience end before it had a chance to start! 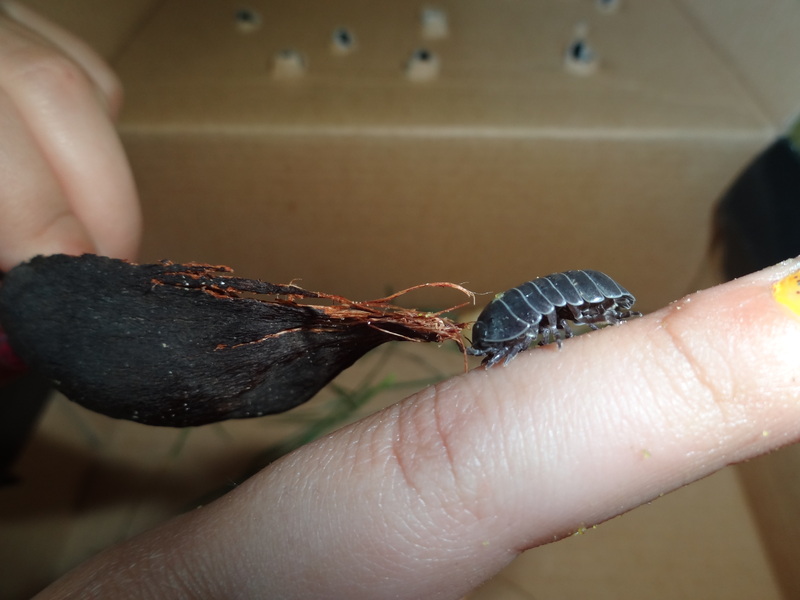 After house hunting, and decorating subsided for this lucky little isopod’s new home, we just had to learn what she needs to eat! Now Sarafina is well equipped in her new abode. Lots to do and see for a bug right? Ella already thinks she likes to play hide-and-seek, because every time we peeked in Sarafina was hiding under something. 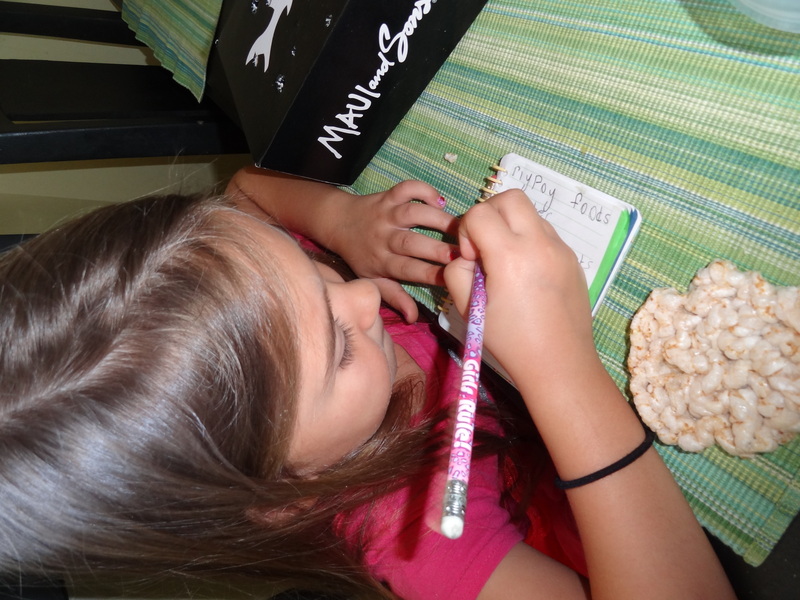 It’s cute to see a little imagination with this probably short adventure…. Ella’s friends made her fully aware today that poly’s don’t often survive the night. We are prepared for a burial service by tomorrow, but that’s okay! Ella understands it’s just part of a bug’s life. Sarafina lived a very complete life of a bug, after the adventures she had today anyway! Ella told me that she really wanted to do this to prove to me that she could be responsible enough to get a tea-cup chihuahua like her Aunt. She wants one VERY bad and believes that by feeding the poly and cleaning poly poop if there turns out to be such thing, than she would be able to handle a dog. I couldn’t love this rationalizing anymore than I do, because it’s so hilariously cute and I love that she means well! I told her I can’t promise the dog, but I know this does show how responsible she is. She has been guarding the box with her life the rest of the afternoon. Hopefully little Sarafina at least makes it through one night but we will see. I’m actually excited because this new pet tied in well with our recent studying of the amazing skeleton and the exoskeleton. I love it when teaching moments tie in so naturally to what life has to offer us each day!